Software Engineer on the New York Times core iOS team, working on the iPhone and iPad News Reader apps. The iPhone app New York Green encourages eating local produce by providing information on Green Markets and Community Supported Agriculture as well as local-grown produce with availability and recipes. Collaboration between Adobe Creative Technologies Lab and MTVNetworks Research. Used the pre-rendered tapestries to create a multi-touch video multi-layered navigation project on the Samsung Galaxy Tab. Wrote a book on developing mobile apps (iOS and Android) using Adobe AIR. Published by O Reilly in May 2011. Biodiversity hall at the Museum of National History. The interactive part of the Spectrum of Life mirrors the 100 foot wall of the physical exhibit displaying 28 living groups and 1,500 specimens. Designed and co-developed the kioskes. Collaboration on the creation of a 146-hour cycle animated landscape portrait. It uses a probability equation within the predictability of seasons and offers a setup to provide the artist with maximum creative freedom for modularity. For LocalProjects and the New York Visitor Center. Using smart tables and digitized pucks, users can explore a map of the city and save locations of interest. Programmed the flythrough. For Antenna Design. 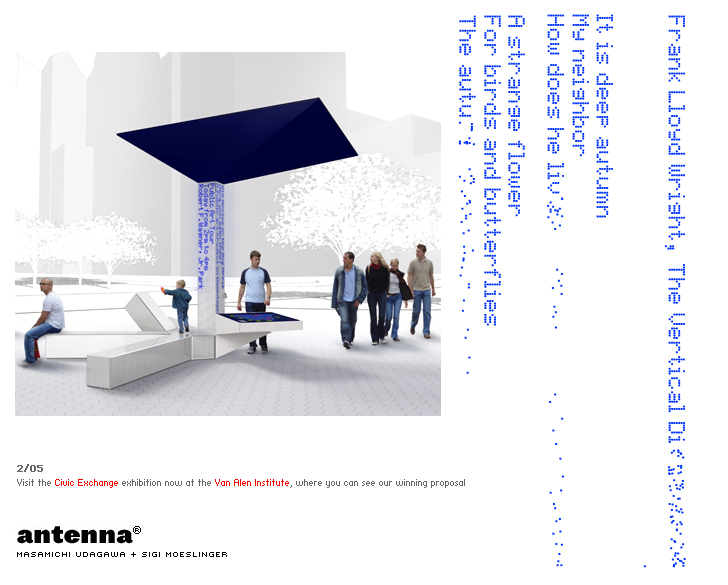 Prototype for an interactive installation in Lower Manhattan. Developed the programmatic animation for the LED messaging system. Enterprising Women for Picture Projects, the website accompanying the New York Historical Society exhibition on women in business. Collaborated on its concept development and user experience. Developed it. 360degrees for Picture Projects, a web documentary on the U.S. criminal justice system. Collaborated on its concept development and design. Animated and programmed the timeline component. I created these interactive modules to teach color theory and concepts. They can be imported to Adobe Flash as custom panels. Moving away from the grid interface, this is fan-like video menu for the nick.com/videos website. Designed, animated and developed. Lifetime Open House for POP and Company, a complex strategy game on an isometric grid. Programmed the game and collaborated on the game design. Game Grid and Opinionator with Frank Lantz and Eric Zimmerman for the 2008 Game Developers Conference, Game Design session. Developed them. NickFlips is a multi-player turn-based board game. It features a lobbying system, messaging system, scoreboard and a complex game play. Developed the client side of the application Nicktropolis a massively multi-player online game. Each asymetric room offers a different game where the avatar is used as the interactive element. Web Premiere Toons are innovative interactive cartoons, created by Garry Panter and Funny Garbage for Cartoon Network online. Programmed all the games and interactivity. When Flax first introduced the Drawing API, I developed this drawing and animation tool for the 5k competition (the rule is to create an application of a maximum size of 5 Kilobytes). I won second place. An old portfolio site. Different animations appear depending on the time of day.